Dandelion art project was a lovely outdoor explorations followed by the painting project. We explored and reviewed light and dark colors yellow and green, and had some color mixing fun. 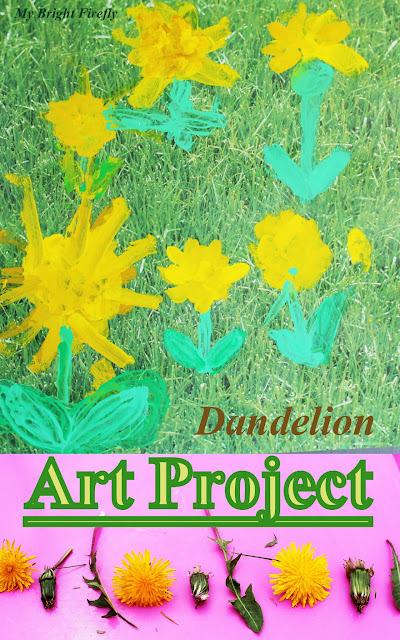 This paint project had great opportunities for exploring short - long strokes, or paint brush dabbing; filling negative spaces with dandelions. Learning to manage paints and a brush is a process! We spent a lovely afternoon on a lawn filled with dandelions. We had some tools and a snack - enjoying the spring weather, and the colors and smells. We observed dandelions noticing parts of the plant, and colors and shades for each part. Pictured above: fun with dandelion patterns. a cup of water and a paper towel. 12" by 12" printed paper, a photograph of the grass, was used for this activity. We discussed the colors we noticed during our outside explorations, then the options of paints on the table for creating lighter - darker yellow and green. For mixing, I filled a couple of spaces of the palette with yellow and added drops of brown to one of those. For ligter green, we mixed green and white. On a separate piece of paper, we explored the effects of short and long strokes, dabbing brush and using Q-tips while using light and dark yellow. I encouraged using dabbing brush or short strokes during the painting time to keep the dark and light yellow strokes visible. If the colors were completely mixed on paper, another layer of short strokes was added. Kids discover naturally that washing brush before using a different color is a good idea. For us, this process does take time. My Firefly is a fan of brush washing and changing the color of the water in the cup (whenever she remembers to do so). It helps to have a sturdy see-through plastic cup half full with water. Spring is the best for having fun outside with so many beautiful opportunities for the new discoveries and art projects!